There's nothing like having a vehicle that is capable of meeting your every need. When looking for a vehicle that meets those criteria, the list is short and really only leaves one possibility. Because of the many benefits that it provides, buying an SUV to get you around town is a smart idea. Features and benefits galore are packed into SUVs. The biggest and most obvious of these is the ability to get a larger number of people around at once. 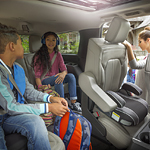 This makes these vehicles great for families and for taking trips with friends. Another key benefit that SUVs provide that make them a smart choice to own is the available cargo space. Whether loading up groceries, visiting the lumber yard, or loading up luggage for a family and friends road trip, the cargo space that comes with SUVs extends their usefulness in ways that owning a car simply can't match.